Mold is a long-term issue associated with flood damage because areas can remain wet for long periods of time after being flooded which provides the perfect atmosphere for mold to grow. If your place of business suffered even a small amount of flooding or leaking, the walls, ceilings, subfloors etc. could be contaminated with mold already. Long-term exposure to mold can lead to health issues that could also be compensable under workers’ compensation. Business owners should have a professional check their building for signs of mold if they have leaks of flooding from the recent rains. Structural damage is another potential issue from heavy rains and flooding. The ground supporting structures can quickly erode from flooding, and building materials such as wood can be damaged from standing water. This could lead to floors giving way, sinkholes opening, or even structures collapsing. Keep an eye out for any potential issues with your structures to avoid getting hurt. 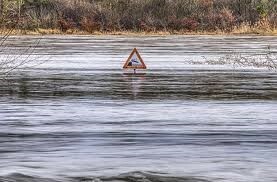 Although the flooding may have stopped for now, long-term health and safety issues are still a viable threat. Keep an eye out for any issues that could put you or anyone else in danger, and if you see something, tell whoever is responsible.